An upgraded fuel rail is necessary for any car making that has a major increase in power over stock. As an engine is upgraded its airflow increases, therefore creating greater demand for fuel, but the factory fuel system can only compensate to a certain point before it simply can?? ?t keep up. This kills performance. Tomei's increased pipe capacity creates a reservoir of gasoline allowing the fuel system to deliver plenty of fuel even with oversized injectors. Tomei fuel rails feature high heat radiation to prevent percolation and facilitate stable pumping pressure. Tomei's fuel makes a great addition to injector upgrades. Made from high grade light weight billet aluminum, this fuel rail has the durability to withstand extreme conditions. 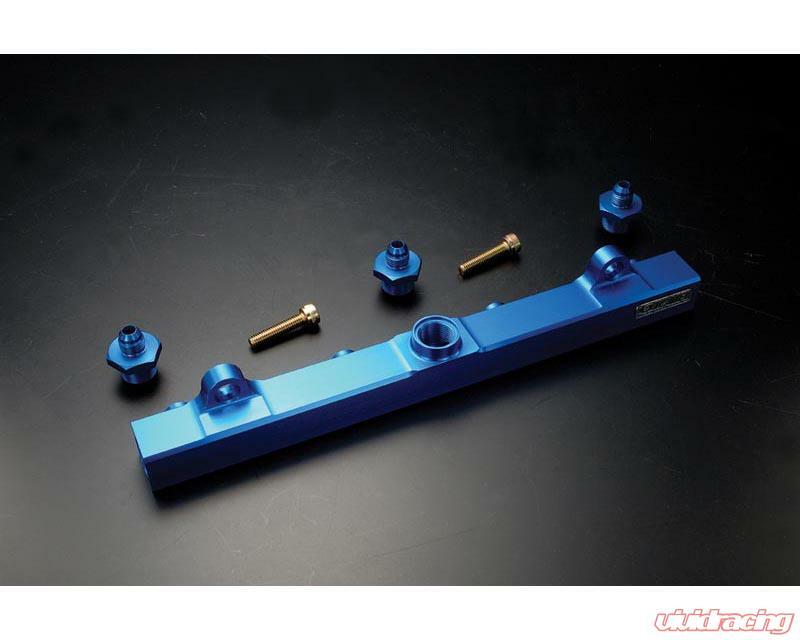 Its anodized blue color adds a finishing touch to your engine bay.